Finally, repetitive magnetic stimulation (rTMS), could be a useful neuromodulating treatment for chronic migraine when all the other treatment failed. rTMS (on the occipital visual cortex) showed already encouraging results for episodic migraine prevention and for the treatment of the migraneous aura. 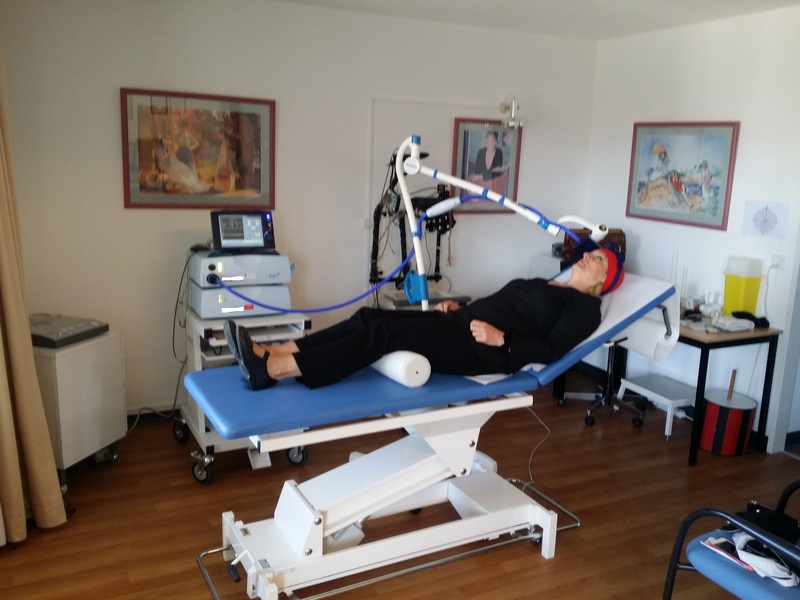 rTMS is a noninvasive method used to stimulate small regions of the brain. During a rTMS procedure, a magnetic field generator, or “coil” is placed near the head of the person receiving the treatment (see the machine in my office in the picture). The coil produces small electrical currents in the region of the brain just under the coil via electromagnetic induction. The coil is connected to a pulse generator, or stimulator, that delivers electrical current to the coil. The magnetic field applies to the brain up to 3-7 cm under the skull, about 2000 times during a standard session (15-30 minutes). Thus, rTMS can induce increases or decreases in excitability of large populations in deep areas of the brain. Excitation or inhibition of thalamo-cortical circuits could reset pain neural pathways. The treatment has almost no side effects. However, patients with epilepsy are excluded from the procedure because of the risk of crisis. Rarely the procedure could give mild local discomfort and pain. Some patients experience transitory changes in working memory and mood. However, results of recent studies of rTMS are still preliminary and sometime negative for chronic migraine. Such studies indicate also a powerful placebo response to the sham stimulation (probably due to the suggestion to become magnetized! (“I magnetize you the doctor said”). It is not yet clear which the part of the brain to stimulate is and this could be a very important limiting factor for the procedure. In the future, neuromodulation with rTMS will probably have a better place in chronic migraine treatment, especially because of its attractive safety profile. However, now, which protocol would you suggest for rTMS in patients with chronic migraine? Una risposta a rTMS for chronic migraine?